mous scale and it s after-effects ev en more grav e.
though well researched, is still very uncertain. prove to be an ill-conceived and ill-timed act. pects is the effect on agriculture. 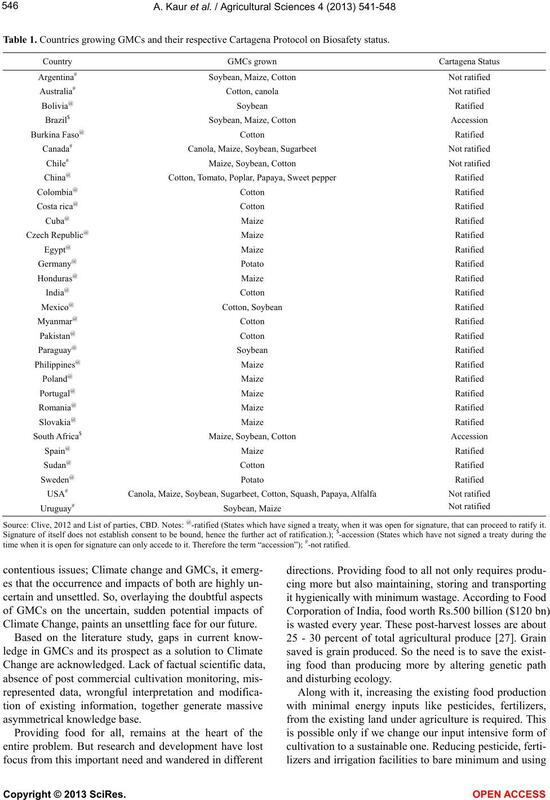 sed CO2 levels and various farm level adaptations . and Argentina as the top three countries (Figure 1(a)). the most popularly grown Source: Clive 2012.
feeding our ever growing popul ati on in t he warmer worl d.
to CC appear to be overdrawn and entirely premature. house gas (GHG) emissions in number of ways. really been achieved, is still questionable. son, the HT and IR crops show better performance. evolved resistance to Bt cotton . veloping GM nitrogen-fixing and drought resistant crops. drought resistant crop appears to be relatively impractical. 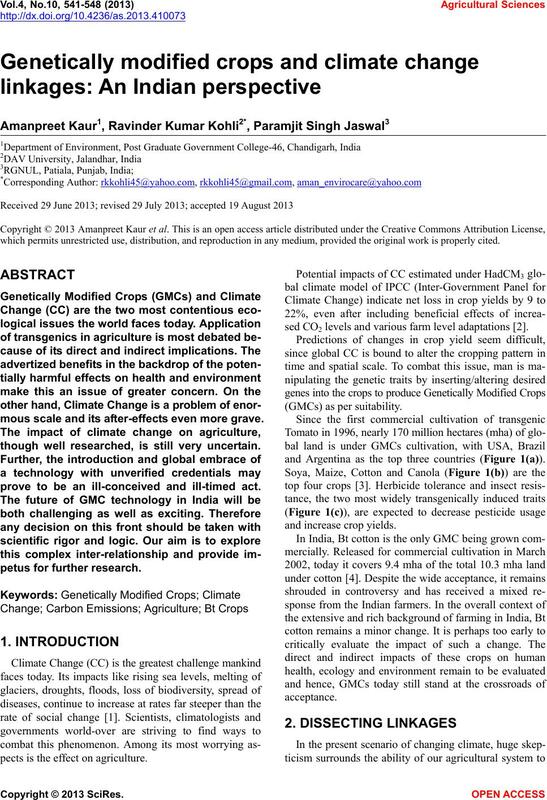 gions of India and develop climate resistant hybrids. lower emissions and a befitting altern ative to fossil fuels. and indigenous people and loss of biodiversity . tolerance and six insect resistance traits. sector researchers hold only 10% . 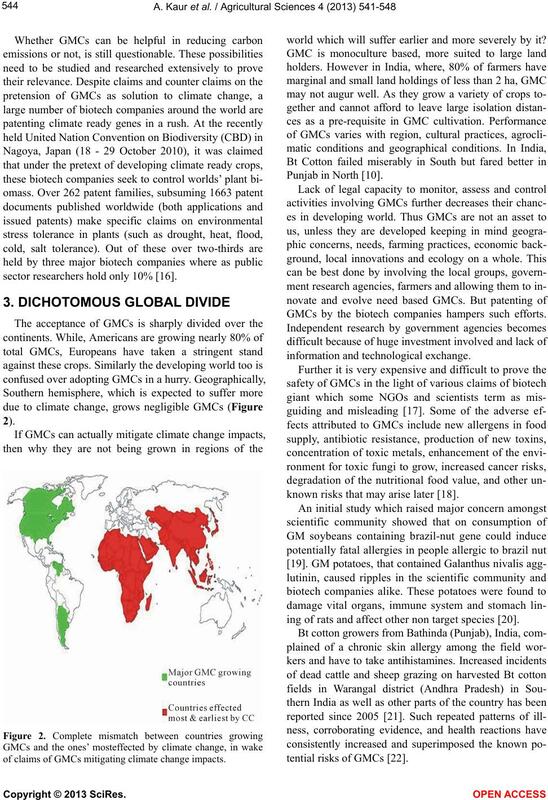 of claims of GMCs mitigating climate change impacts. world which will suffer earlier and more severely by it? Punjab in North [10 ] . GMCs by the biotech companies hampers such efforts. known risks that may arise later . ing of rats and affect other non targ et species . tential risks of GMCs . twined in controversies right from the beginning. strongly opposed by various sections of the society. tivity, turning India into major cotton exporter . ecological research only, can settle this economic issue. ly worship various plants and animals. known potential changes in climate could be even worse. dollars for every new transgenic plant to be invented. Table 1. Countries growing GMCs and their respective Cartagena Protocol on Biosafety status. Source: Clive, 2012 and List of parties, CBD. Notes: @-ratified (States which have signed a treaty, when it was open for signature, that can proceed to ratify it. time when it is open for signature can only accede to it. Therefore the term “accession”); #-not ratified. Climate Change, paints an unsettling face for our future. remarkable gains from them appears impossible. dge of locals to give it a new direction. lowing and encour aging us to wor k .
 Nisbet, M.C., Hixon, M.A., Moore, K.D. 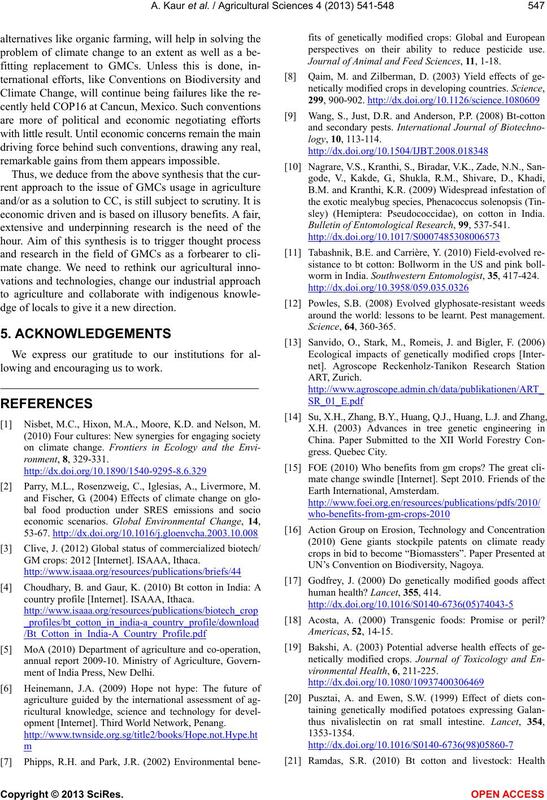 and Nelson, M.
 Parry, M.L., Rosenzweig, C., Iglesias, A., Livermore, M.
GM crops: 2012 [Internet]. ISAAA, Ithaca. country profile [Internet]. ISAAA, Ithaca. ment of India Press, New Delhi. opment [Internet]. Third World Network, Penang. 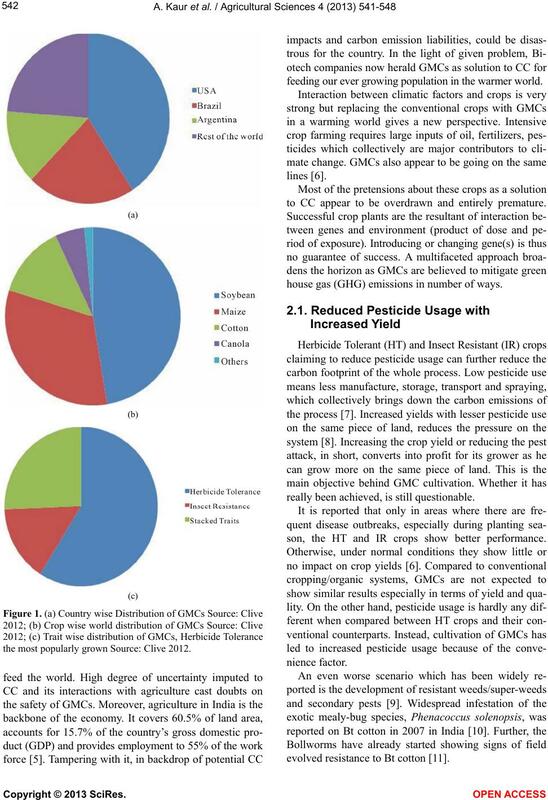 perspectives on their ability to reduce pesticide use. Journal of Animal and Feed Sciences, 11, 1-18.
sley) (Hemiptera: Pseudococcidae), on cotton in India. 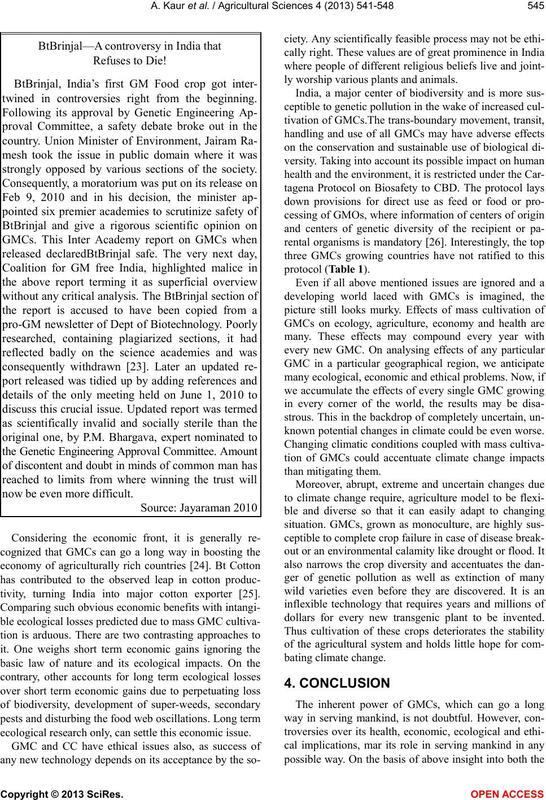 Bulletin of Entomological Research, 99, 537-541.
worm in India. Southwestern Entomologist, 35, 417-424.
around the world: lessons to be learnt. Pest management. UN’s Convention on Biodiversity, Nagoya. human health? Lancet, 355, 414. Acosta, A. 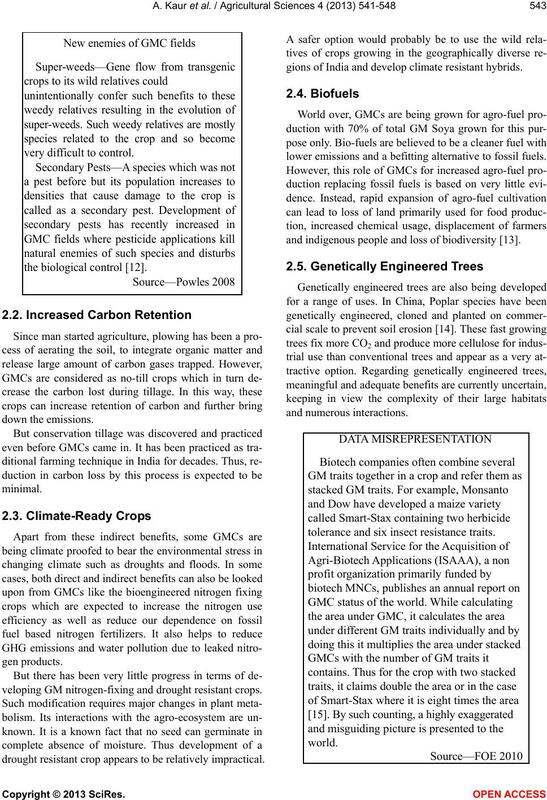 (2000) Transgenic foods: Promise or peril? tainet. India International Centre, New Delhi. risks of Genetically Engineered foods. Yes! Books. Jayaraman, K. (2010) Bt brinjal splits Indian cabinet.